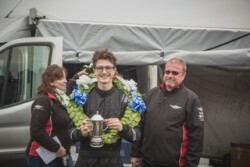 Win win win at Snetterton!! 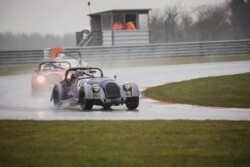 Elliot mastered the torrential conditions in his Kennedy Care Group sponsored Roadster to claim victory, by some margin, in both races…….his first outright victories in the Morgan Challenge! In each case followed by “dad” having (almost!) tamed Andrew Thompson’s mighty Plus 8 to take Class A honours. Tim Parsons fought his way from 19th to finish 6th claiming Class R victory and being awarded “driver of the day” for his fine efforts! The perfect start to the race season for Team Revolutions!